"I am starting to worry about my 6-month-old baby shaking his head from side to side. What I first thought was a normal behavior, maybe some move he discovered, is now giving me chills. After a small research, I found out that he might have sore ears or a learning disability. He seems fine besides shaking his head vigorously a couple of times a day. Phoning HV is the first thing I'm doing tomorrow morning. Has anyone else experienced this baby shaking?" Just as the mom described above, many new moms will be concerned for any unusual behaviors present on the baby, like baby shakes head side to side. Even though it seems like an abnormal behavior, in most cases, you have nothing to worry about. Here are some of the things you need to know about this problem. Is It Normal If Baby Shakes Head Side to Side? The answer can be both yes and no. Baby shaking heads side to side can be interesting and concerning at the same time. For parents, you just need to keep an eye on the baby to monitor the possible issues at this stage. The head shaking affects numerous babies at the age of 3 to 7 months old in moments of curiosity, fatigue or boredom. Some babies shake their head to learn of the control over the body, and some babies may even do this when they feel sleepy. Interestingly, some babies like the dizziness that follows a vigorous shake. However, there are cases that an ear infection hides behind the shaking head behavior, through which the baby can gain some comfort. If they come down with fever and become inactive, make sure to check this with the doctor timely. Can It Be Autism? Are There Any Signs? Some people believe that the head shaking is correlated to autism. This is not necessarily true when it is an isolated event. However, when it comes along with some of the following signs, the best thing to do is to immediately contact the pediatrician. If it is diagnosed to be Autism Spectrum Disorder (ASD), an early treatment will generate a better outcome for the child. They lack social interaction. If you smile at the baby and he/she doesn't smile back or if he/she don't gaze eye, it can be a sign of social impairment. Also, rarely responding to their name, showing little interest in sharing their toys or even having a distant attitude may be counted as symptoms of autism you should take care of. They lack communication. Some of them would talk in a monotone way (their speech will not vary in pitch, will have an odd rhythm and no intonation), show few gestures and have little coordination when communicating non-verbally. They show a repetitive behavior when playing with toys or simply sitting. They lose some of their skills. At the age of 19-21 months, they stop making eye contact, social smiling, they lower their interest for interaction, as they can no longer use words or understand what they are being told. For parents, if you notice any of the above signs, it is better to err on the caution and get in touch with the doctor. It is better to follow your parental instinct when you suspect an ASD on your baby. Also, you can contact a local school to ask the information about early intervention social education specialist, which will give you a green light for an appointment. Are There Any Other Unusual Behaviors to Watch Out For? Aside from baby shakes head side to side, there are some other abonormal behaviors that parents should notice. Besides the symptoms mentioned above, there are some other abnormal behaviors you should notice, such as banging their head against wall, furniture or crib bars; rubbing or stroking body parts like the parents' belly, feet or ears; pulling their hair; rocking their body; grimacing or shrugging their shoulders. These behaviors will be more visible during bedtime routine, as babies use them to soothe themselves before sleeping. When you notice any of the mentioned behaviors, you should contact the doctor to rule out any possible issues hiding behind those behaviors. According to experts, it is crucial to have your baby develop fine motor skills through their hands as manual dexterity is tightly linked to creating a cognitive baggage. How the baby develops: Babies have a normal response of closing their fists tightly when they are crying or surprised. They also make smoother movements with their arms and legs and have the tendency to bring their hands up to their mouths. How can parents support: In order to strengthen their back, make sure the baby plays on his tummy. In addition, try investing in a baby gym that has dangling toys as they will make your baby practice hand-eye coordination. How the baby develops: During this phase, the baby will develop fine motor skills. He will coordinate his thoughts and hand movements, meaning that he will choose the toy they'll grab, reach for it and move it from one hand to the other or from their foot to their hand. How can parents support: Try playing pat-a-cake or placing soft objects between the baby's hands to improve coordination. Also, you should change the baby's positions frequently in order to challenge their motor skills to develop thoroughly. How the baby develops: The baby has already refined motor abilities and the newest coming challenge is to feed itself. 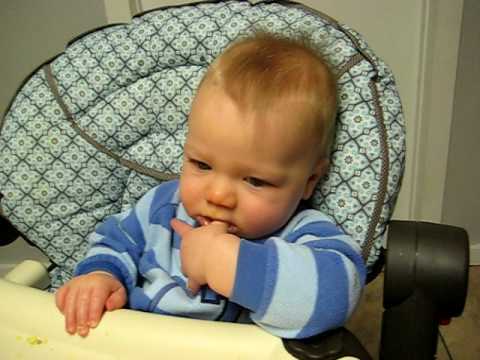 Babies become able to gather food in their fists, but cannot certainly put the food in their mouth. They will likely play with it until boredom than throw it, but the important fact is that they make the difference between food and their fingers. How can parents support: It's ok to let the baby make a mess of their food as they practice the fingers' muscles. When playing, however, make sure their head and back are supported. During this period, you will notice that the baby can stand on their feet and hold, and they pull to stand and use fingers to point at things. How the baby develops: The baby is now able to operate with their fingers, independently one from another. That means the mouth, nose and ears become paths to explore. You will note them making hand movement in order to say they want to be picked up. They will also bang things together, sit or stand without help, repeat sounds and clap to music. How can parents support: In order to help the baby discover the individuality of the fingers, try investing in some clay and let the baby poke in with their fingers. Also, make them squeeze toys. If you seek for more information about baby development, click HERE.